Tthe DJ collective of Andrei Osyka, Brett Griffin and Justin Sloe. From their start 6 years ago, DROOG has steadily built a reputation as one of the leading purveyors of forward thinking dance music, in Los Angeles and beyond. The collective have become known for their respected parties that through the years featured leading international house and techno talent, from Magda, Jamie Jones, Steve Bug and Martin Buttrich to Dixon, all four memebers of Visionquest, Nicolas Jaar, Dyed Soundorom, Shonky and beyond. Droog have also masterminded showcase parties at WMC, DEMF, BPM and Sonar festivals. 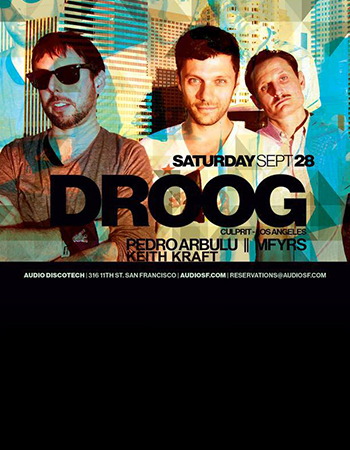 Between 2007 and 2011, Droog had held down a residency at Avalon Hollywood, one of the biggest clubs in the US. At Avalon,they have had the chance to play alongside influences such as Richie Hawtin, Lee Burridge, Steve Lawler, Damian Lazarus, Tiefschwarz, Mr. C, Booka Shade, MANDY, Matthew Dear. Performing alongside some of the world’s top electronic music artists, Moby, Max Cooper, Super Flu, Tube & Berger and Sebastian Leger. He continues to connect to listeners with his heavily influenced sounds of deep melodic house & techno. He draws his inspiration from the growing number of electronic music listeners around the world. Music For Your Robot Soul.